Hi everyone and we hope you are all well. 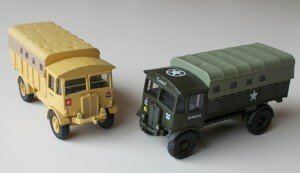 The rain keeps coming down again so this month we’re devoting to showing you more of the lovely military models produced by our good friends at Oxford Diecasts. 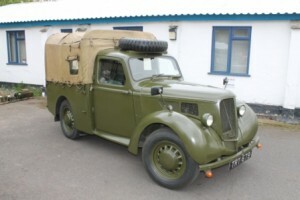 We start with a classic Standard Vanguard from the 1950′s which was very popular with the RAF. This model captures the lines really well and the amount of detail on the model is amazing when you consider it’s only about 50mm or 2 inches long. 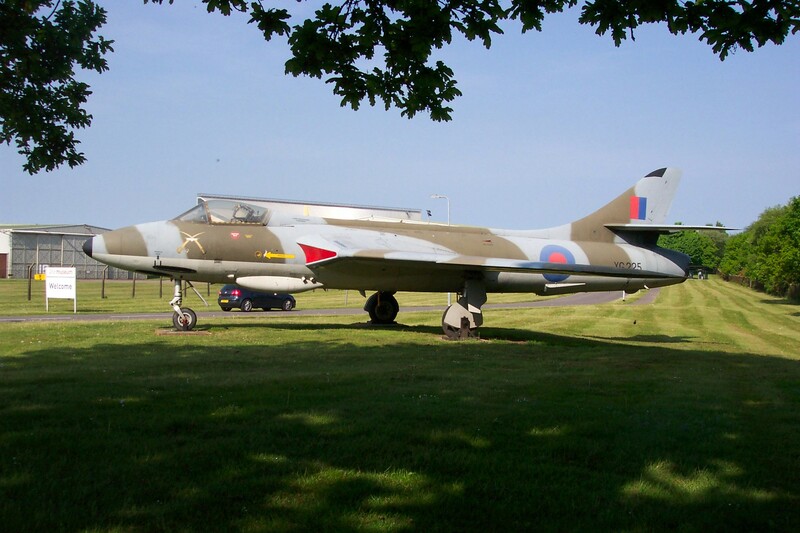 It would fit in with other similar scale models say by Airfix for a 1950′s RAF base complete with Hawker Hunters ! Another cracking model is this typically British Morris Minor 1000 Traveller from the 1960′s and 1970′s. 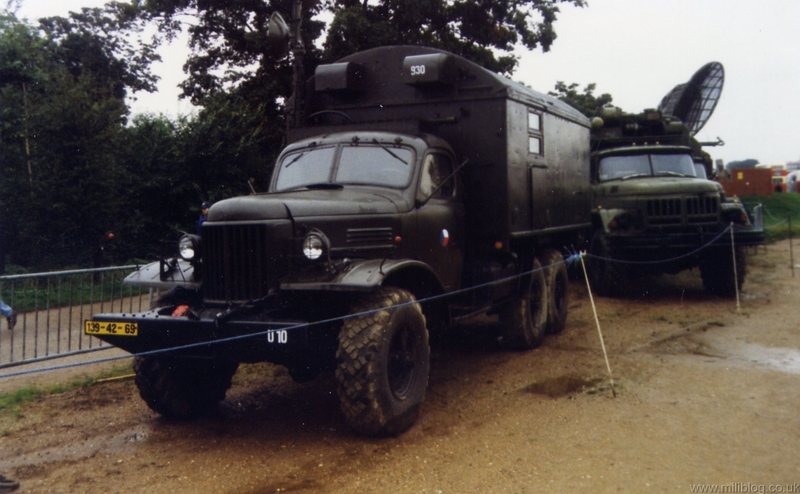 The British Army used 1000′s of these as basic communications vehicles. 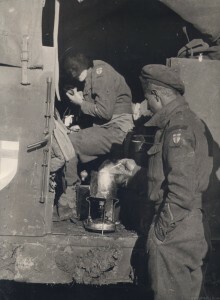 With many army bases across Germany ready to defeat the threat of invasion from the Iron Curtain, they were used to carry post and paperwork between the command centres and camps. 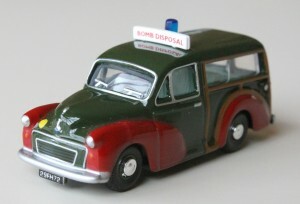 This model is painted with the famous bright red wings of the Bomb Disposal Squad, which carried engineers to difuse either terrorist bombs or many WW2 bombs found on construction sites around the country. We’ve already featured the little Bedford MWD 15cwt in it’s first 1944 Mickey Mouse camouflage scheme and now we have our desert finish. It’s just a little jewel of a model and cheap enough that it’s already becoming very popular with wargamers. 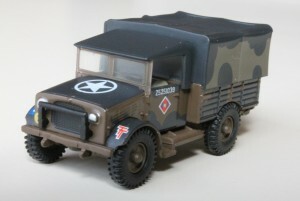 This next model appeals to both military vehicle fans and also bus collectors too. 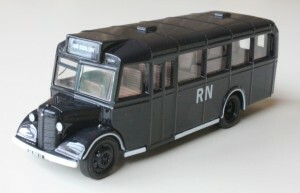 Although a wartime vehicle, it features a post war livery of a British Royal Navy bus used to ferry personnel around. Launched very close together is a fantastic model of the AEC Matador Gun Tractor in ywo colour schemes, namely a desert livery and also North West Europe campaign colours too. Very detailed one can only compare it the Airfix plastic kit which has been around for many years. Just click on any of the photos to enlarge them and have a closer study of the detail. We’ll certainly be looking for new releases later this year. Rolf our dog is looking for a walk now, so on go the wellies and raincoat and I’ll be back soon ! Well the season rolls on and so does the rain and wet weather !!! We wanted to go to the Catton Halll Show Near Lichfield but it was rained off !!! 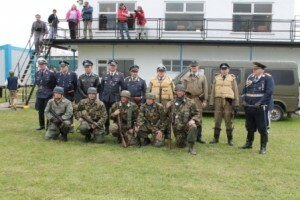 Last we went along and supported a new event being held at Halfpenny Green Airfield called surprisingly Halpenny ar War. There’s a separate report soon appearing on Miliblog with load of photos, but there’s a few photos below to whet your appetite. This must have been the only weekend in May that we had dry weather and everyone was glad to be out enjoying themselves. So with shows being cancelled, we’ve again this month turned toadding to our modern British Army TRFs and I’ve added some samples below. 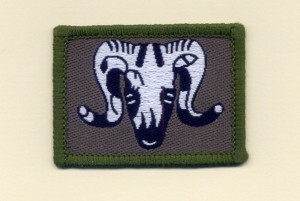 Again have a look in our badges section for a more of them. 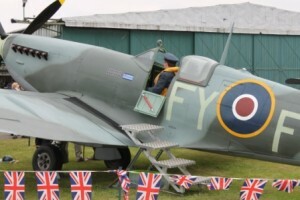 So as we come upto the anniversary of the D-Day landings on June 6, lets’ get out there to some dry shows ! Well we’re back once again after a bumpy few weeks and can’t wait to share some of new stuff we’ve been adding to the collection over the winter months. 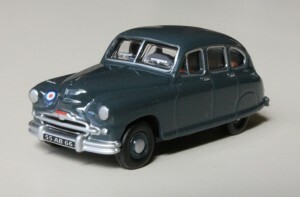 You may have read already on Miliblog how excited we were to see our first sample model from Oxford Diecast. 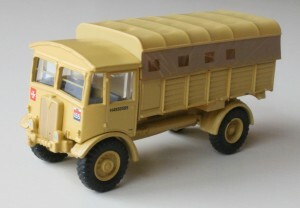 Miliblog were quite flattered to have been asked by Oxford Diecast to work with them to launch a range of British military softskin models. 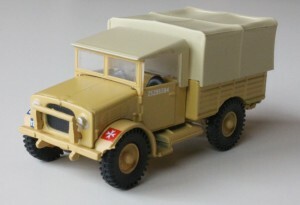 The first is an absolute cracker and as you see below is a very good small scale replica of this lovely WW2 15cwt truck. All in a scale of 1/76 the same scale as Triang Hornby model railways or Airfix plastic model kits of military vehicles. Also ideal for wargamers and at about £4.50 an absolute bargain. Click on the photo below to get a better idea ! Well in our part of the UK, the Easter holidays with the first classic car and military vehicle shows were a complete washout ! Who wants to take out their pride and joy out in the wet, wind and the mud ! In fact many shows and events were cancelled with some being rescheduled for later in the year. So what can we turn to instead ? 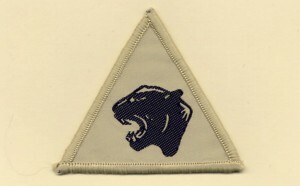 Cloth badges issued for army units were very popular in WW1 and WW2 and even into the 1950′s. But by the 1970′s and 1980′s, they all but disappeared. Come the new millienium, they seem to have come back again ! This time though they’re called TRF’s !!! 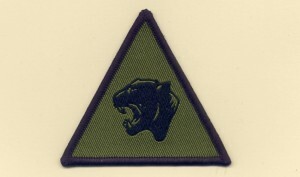 ….or in their fullest description Tactical Recognition Flash !!! 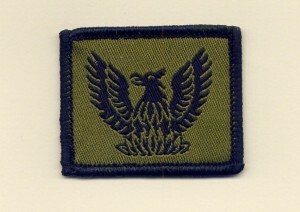 Many designs can be traced back to the second world war or even the colours or the individual regitment or corps. So here at Miliblog, we wanted to start collecting them and share with you these very attractive badges. 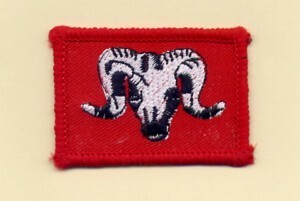 This first one is for the Rifle Brigade know as The Rifles and is the largest regiment in the current British Army. 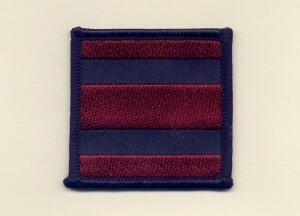 Next we have a nice TRF for the Royal Engineers, with the historic RE colours of red and blue stripes. 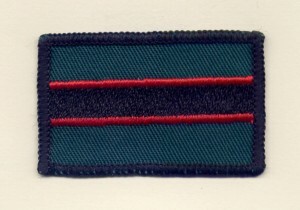 Now these TRF’s are great on the usual DPM modern British Army uniform while in the UK, but a bright basge in combat maybe isn’t such a good idea. So we have three versions of some TRF’s, UK, subdued for combat and then a desert sand version for guess where ! Now with the new MTP, or Multi Terrain Pattern uniforms I’ve seen a fourth version TRF ! So here we show the TRF for the 1st Artillery Brigade firstly in a nice bright red and then a subdued version for combat situations. Well let’s hope the weather picks up for next month and we can get out there enjoying some decent sunshine ! Hello there and welcome back to Miliblog !!! First let’s start with a big thank you to all you fellow military vehicle people out there who have been visiting Miliblog during our horrendous year. Thanks to some nasty person over in the Far East, who gets fun from hacking into people’s websites and messing them all up, Miliblog has been here but without any new items being added for you. Hopefully our website gurus have done marvellous work and now we are back !!! So how have you all been while we’ve been away ? I know we’ve been busy collecting and buying loads of new stuff that we can’t wait to share with you and don’t forget our ‘new images’ tab will show you all the new items that have been added. 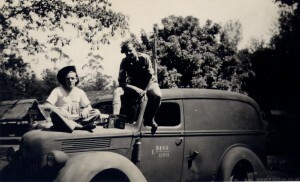 original photos from WW2 showing not only rare and unusual vehicles but also the troops that used to drive them. So watch this space over this year as we bring them to you. 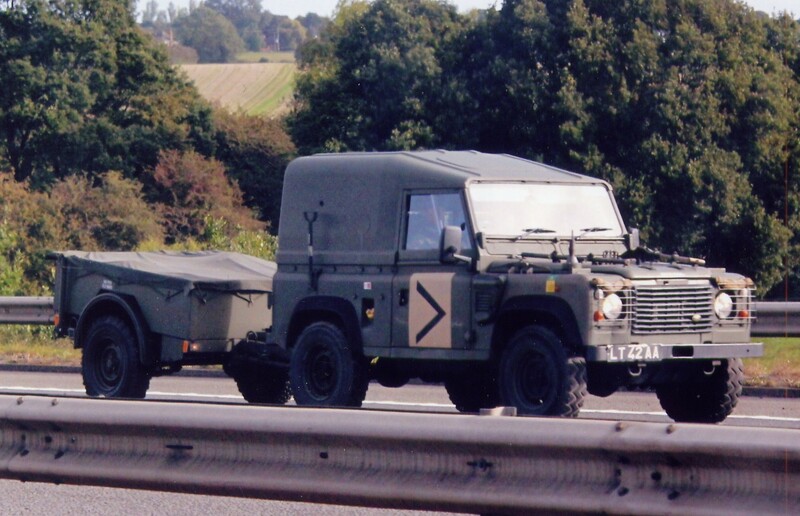 Just to start you off gently, below is one from our Maltese Army set and features a Land Rover Airportable, or Lightweight and then followed by an unusual Land Rover Defender 90 in an interesting camouflage scheme. 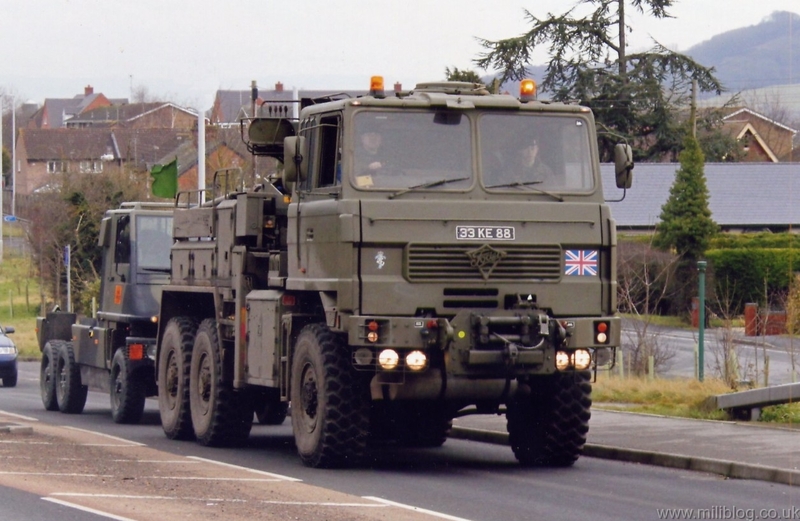 Hello once again and welcome to British Army modern heavyweight week here on Miliblog. 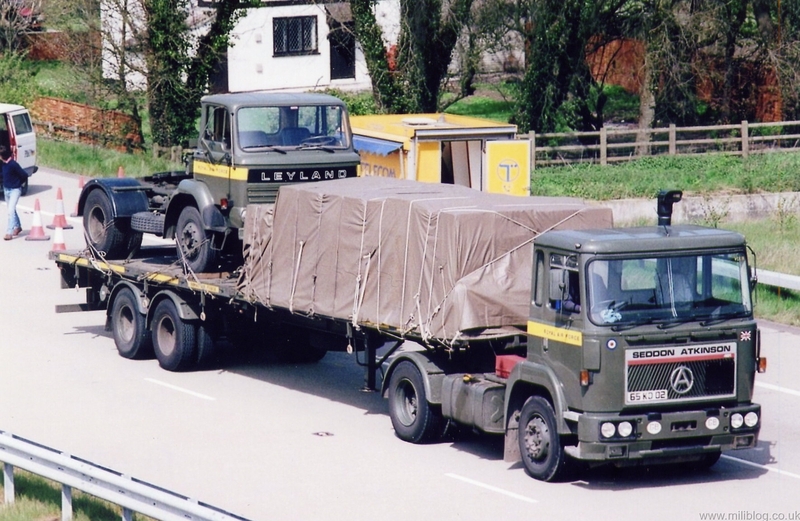 We’ve recently bought a batch of photos from Colin Martin, a well known photographer of all sorts of heavyweight transport on the Britsh roads. 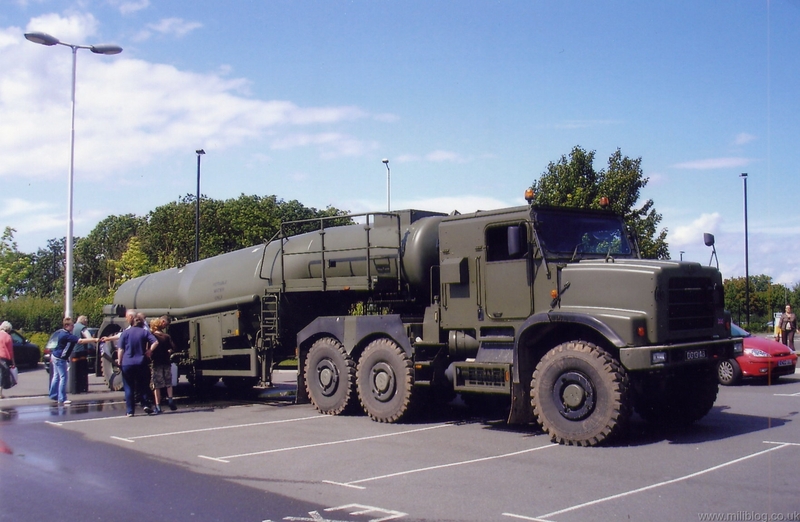 So we thought we’d celebrate these massive vehicles, which probably at first glance on the photos look quite tame.Look further into the photos and compare them against things around them and you’ll see they are pretty big ! 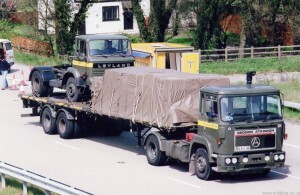 Look at our first photo for example, with a Foden heavy recovery towing a broken down Duro and then look at the car following ! 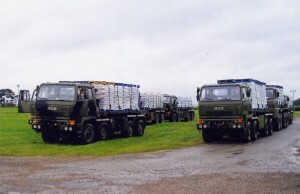 Colin took this shot of a whole load of Leyland Daf DROPS lorries parked up with loads of bottled water on board. Could this be a scene from the War and Peace Show in 2020 perhaps ? Next we have a Seddon Atkinson unit complete with a King trailer in RAF markings. Note the logo on the cab door of an elephant carrying a load. Not sure what unit this belongs to though. Judging from the excavator being at the front of the trailer, this suggests there would have been another vehicle behind that has already been dropped off. 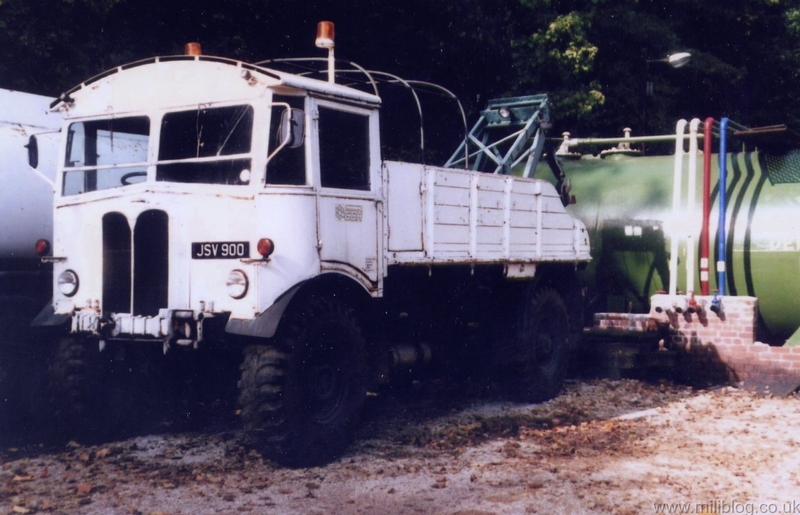 This next photo was taken at Cheltenham Racecourse, with the massive Oshkosh tanker dispensing fresh drinking water to campers. Can’t wait to see the neighbour’s faces if I bought one of these in an MoD disposal sale in a few years and it arrived in our front garden ! Lastly, another Oshkosh product, the gigantic HET (Heavy Equipment Transporter). At 23 metres – that’s 75 feet – long, that’s a big beast to handle. So enjoy having a look around Miliblog. With all the different areas we have, I hope you find something you enjoy looking at. Hello and welcome to this week’s selection from what’s new on Miliblog. 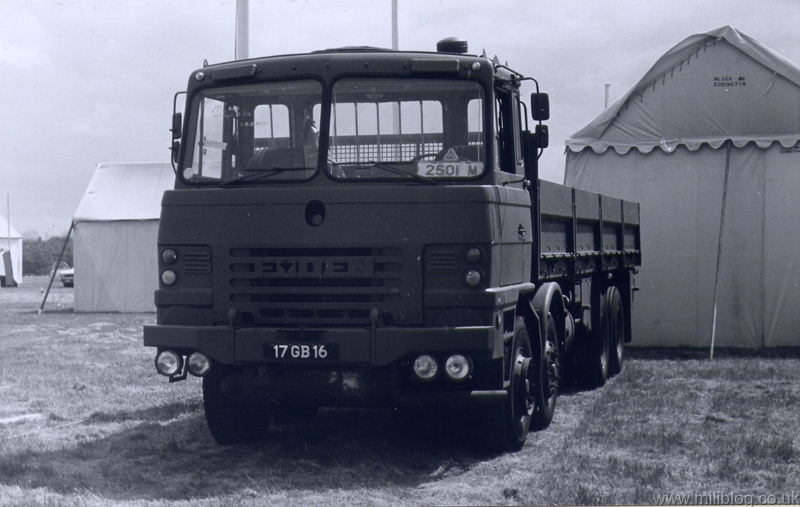 We start with a nice photo of a Foden 10 Ton cargo lorry used by the British Army in the 1970′s for transporting supplies and ammunition close to the front line. 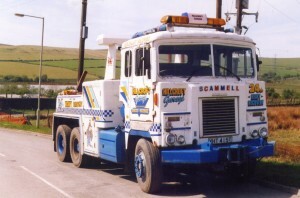 Not as agile as the later 8 wheel DROPS lorries from Foden or Leyland used later on. 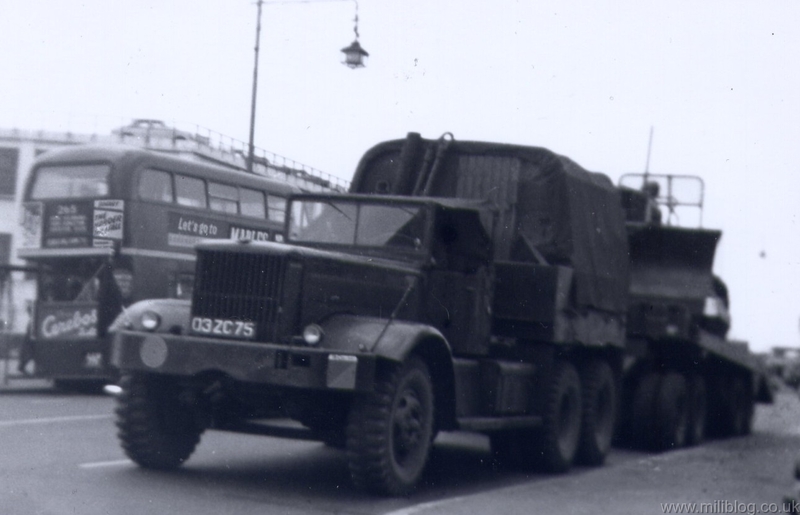 Now we have the famous Thornycroft Antar tank transporter but on this occasion transporting a bulldozer rather than the usual Centurion Tank ! The markings show a Robin Hood type archer, which is for the North Midland District and 19 Coy T, which I think is the 19th Transport Company. 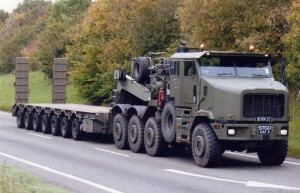 Perhaps it’s on it’s journey to Ruddington Camp just South of Nottingham taking the load for disposal ? Still a lovely period shot of the late 1950′s/early 1960′s. Another tank transporter with another bulldozer ! 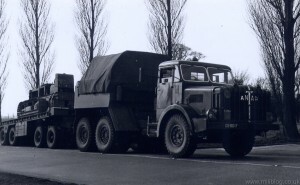 This time a WW2 American Diamond T M20, probably with an upgraded Rolls Royce engine. Similar to the Antar above, it’s towing a Dyson 8 wheeled trailer. 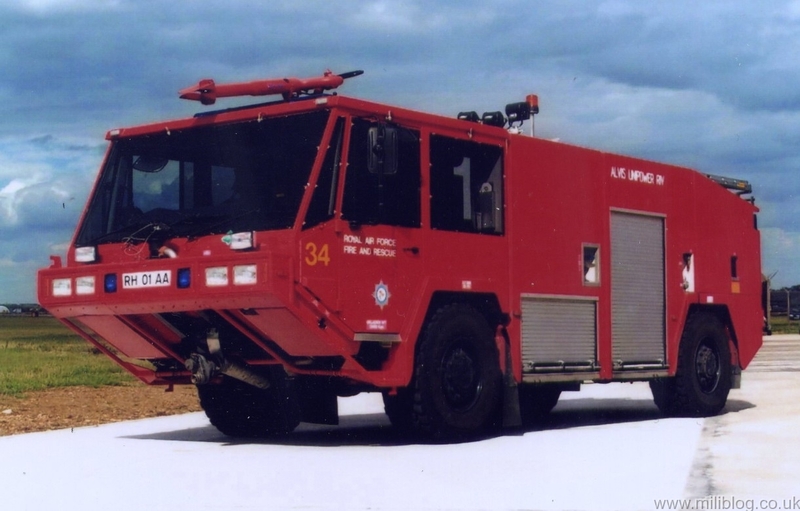 Another of our favourites is this AEC Matador, parked up in the company yard just waiting for the call to attend the breakdown of one of the fleet. It has the markings GBH on the door. Anyone know what company this is ? 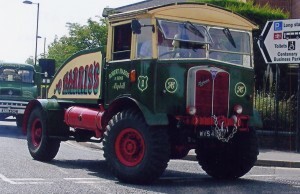 We’ve also got a photo of the same Matador in our WW2 British Gun Tractors gallery but painted red. Possibly a later owner. Finally one for the fire engine fans. 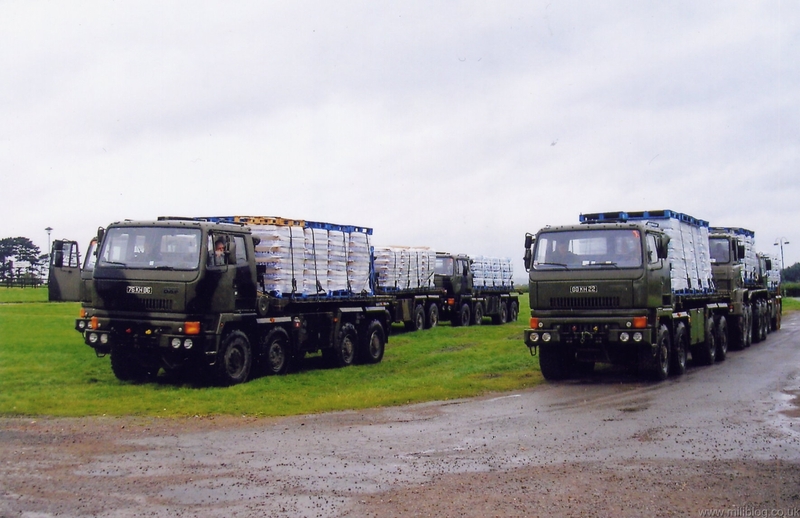 A recent Unipower Alvis 4×4 in Royal Air Force markings. So back to the old scanner to add some more photos onto Miliblog and we’ll soon be back with another what’s new. Hi there and welcome to this week’s samples from what’s new on Miliblog, and we start with a photo of a superbly preserved AEC Matador in the colours of Harris’s Fun Fair. Very popular with fun fairs and circuses after WW2, if you visit our WW2 British Gun Tractors gallery, you’ll find another Harris Matador along with many other Matador photos. 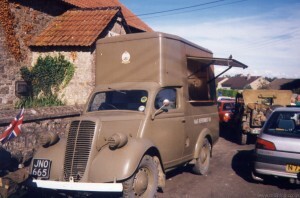 Next from the Home Front is a preserved Ford 10 NAAFI van parked up for an event and now doubt very popular selling it’s teas and cakes. 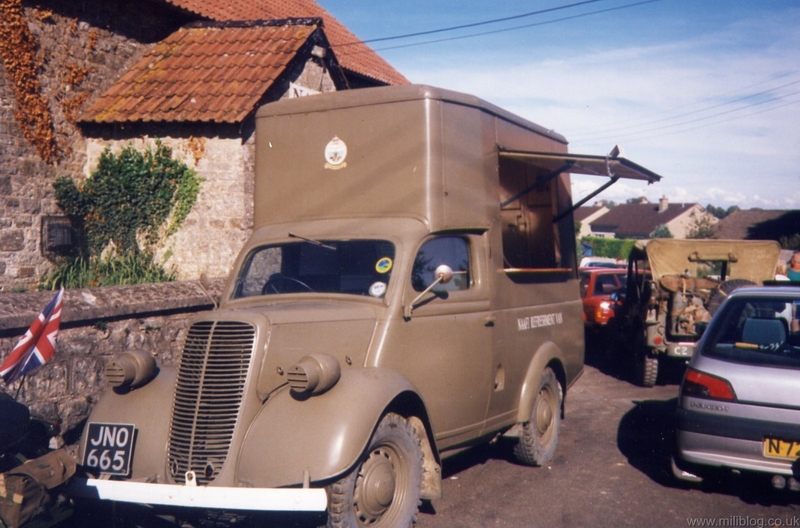 These vans run by the Navy, Army and Air Force Institute – NAAFI – were the mobile catering vans of their day, taking food and drink to remote locations to feed the troops. 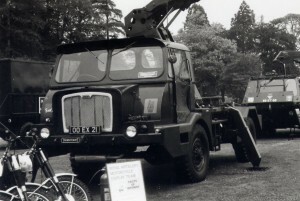 An unusual one next, with a Thornycroft Nubian chassis often used for either a Fire Tender or a Trench Digger, but this time with a Coles crane attached, creating a go anywhere 4×4 crane unit. Looks like a nice summer’s day for a drive down the motorway in this RAF Seddon Atkinson with another tractor unit piggybacking on the back, returning to the depot. 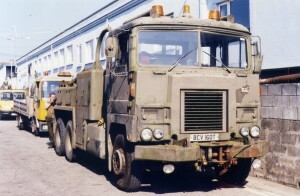 And finally, one for the fans of Eastern Block vehicles in the form of a Soviet Zil in Czech army markings. So have a great week as we get closer to the Spring and the first outings of vehicles preserved during the Winter months. Hi there everyone and welcome to this week’s newsletter with a sample of what’s new. We’re well into January now and like me I hope your used to writing 2011 instead of 2010 ! 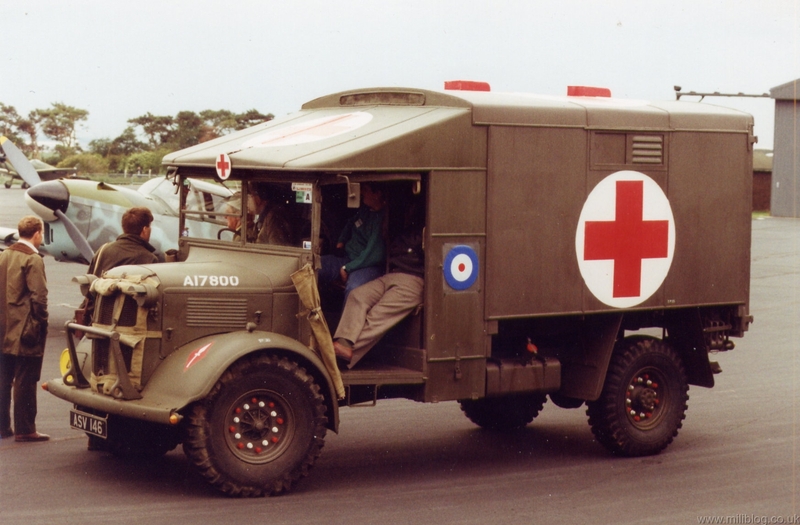 We start with an old favourite, the Austin K2 ‘Katy’ Ambulance, seen here at an airshow some years ago. You can just make out the Me108, yes 108, in the background. 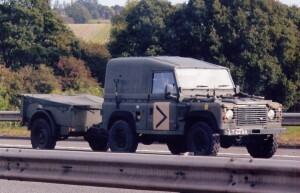 Next is a Land Rover 90 Defender speeding down the motorway with the latest version of our favourite Sankey trailer behind it. Not too sure about the sand coloured panel on the door though as a unit marking. Not very well camouflaged ! 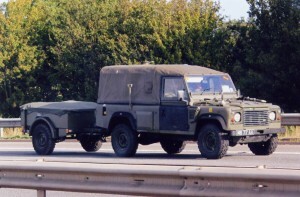 Now we have the longer wheelbase version, the 110 Defender with a similar trailer giving it some welly down the motorway. 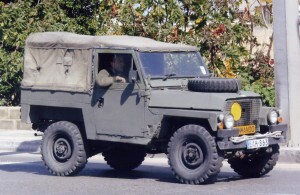 Don’t forget if you’re a fan of Landies, we have quite a selection of 90′s, 110′s, 101′s, Series I and 2 and of the Lightweight or Airportable on Miliblog. 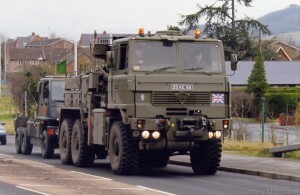 Now we have one of the latest range of vehicles added to the British Army. 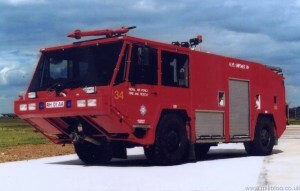 It’s a huge Oshkosh close support tanker. Can’t wait for one of these to come available as surplus, although I don’t think either my wife or the neighbours would be too impressed with seeing it parked on the drive. 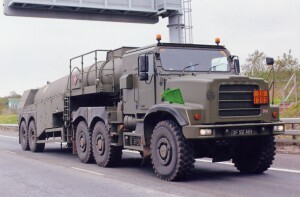 And finally for this week, we have a big Tonka Toy of a lorry. Rugged and functional, this Soviet Zil 131 looks the part and is very popular with enthusiasts that are fresh to our hobby. So once again, my friends have a great week and we’re counting down the days to the Easter holidays, our next bank holiday here in the UK. Hi there everyone and welcome to this week’s newsletter. Well we start off with a big THANK YOU to all of you out there in the ether who visited our little website in December. We had a record number just short of 17,000 visitors and between you looked at over 1.3 million photos. How does that work then ? Well, everytime someone clicks on a photo to look at it, it counts towards. This means on average, each visitor looks at 76 photos ! So I hope you will continue to enjoy visiting Miliblog into 2011 with some exciting things to bring you throughout the year. Also I’d like you all to welcome Footman James to Miliblog, our first advertiser. I’ve been insuring my Ford GPW Jeep with them for many years and so can speak from personal experience that they do a fine job and at a good price too. 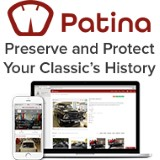 When you’re coming to renew your Military vehicle or indeed your classic car, then click through to their website for a price. Much better than the tubby opera singer on British TV at the moment ! 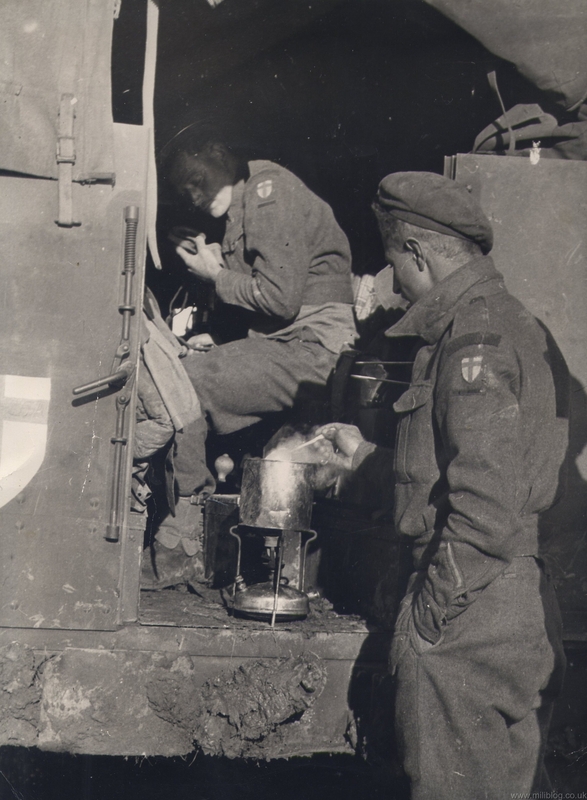 We start with an unusual photo of a Canadian CC60L 3 Tonner lorry shipped over to North Africa and then captured by the German Afrika Korps and put to good use. Then it’s been recaptured or liberated by the Allied Forces, and is possibly off to Base Workshops for a rebuild. Next is a query one for you all out there. 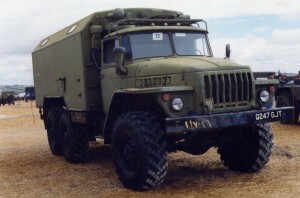 What is the vehicle below ? 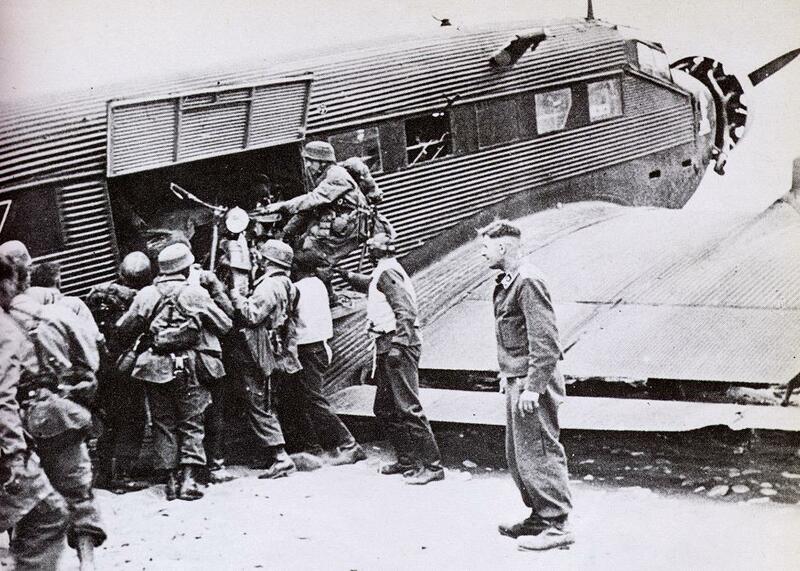 It’s in the Far East and with British Army markings on the door of L5143993. Is it a Dodge or a Ford ? Please email us at info@miliblog.co.uk if you can help ! 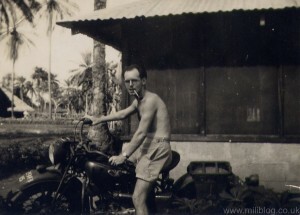 And now one for the motorcycle experts. 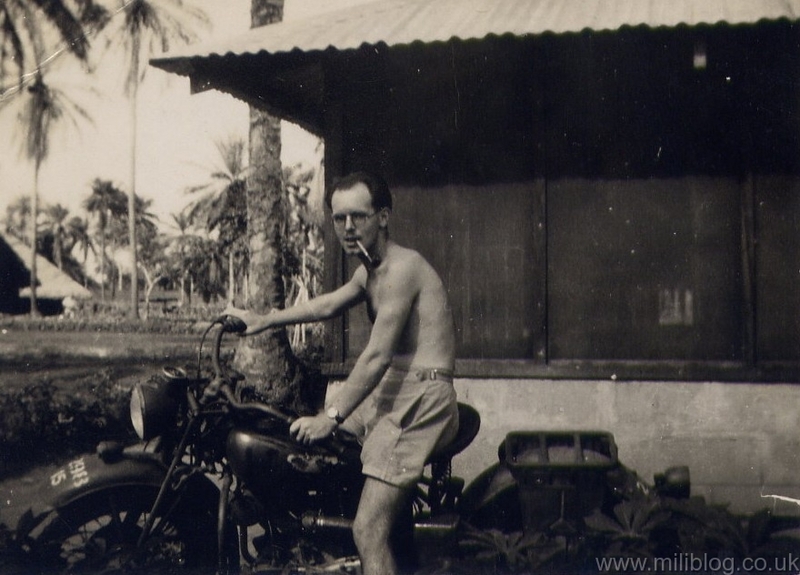 At first I thought this was a Harley Davidson WLA 750, but on closer inspection, the front forks are different. Could it be an Indian 741B ? Again looking from the uniform and the trees in the background, I think this is another Far East photo. And finally yet another mystery for you to solve !!! 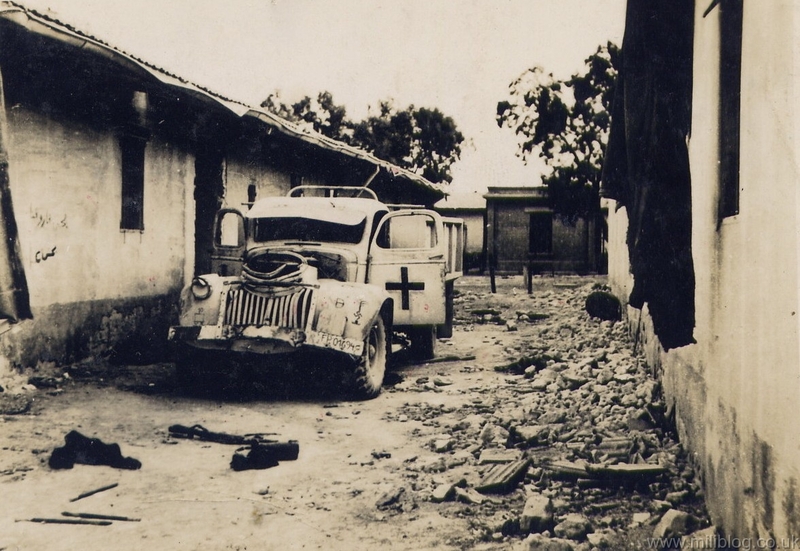 Can anyone identify this vehicle ? 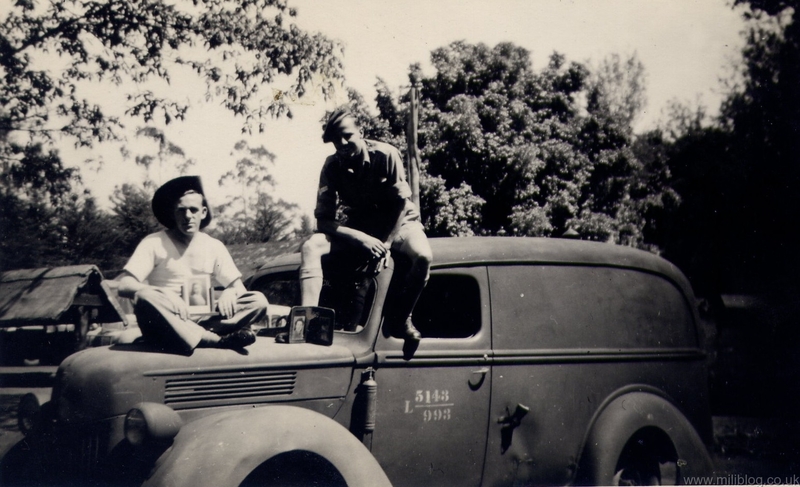 Is it an M5 Half Track, a Bedford QLT troop carrier or what ? Clues are the locking mechanism for the door ! Sorry now prizes for the answer this week since I don’t know myself ! So I hope the snow and ice have all gone for you now and we’ll see you all again next week. Hello to you all and a Very Happy New Year for 2011 ! This year is going to be an even better one for us all. The economy is getting better and it’s going to be a magnificant Summer. While our main passion is for military vehicles, we love to see other areas of military hardware. These can be ships as well as aircraft, which is a whole separate area altogether covered by specialist magazines and websites I know, but I doesn’t harm to add a few here and there to Miliblog ! So to start the year off, I thought I’d just show some samples from our aircraft collection as a variety. 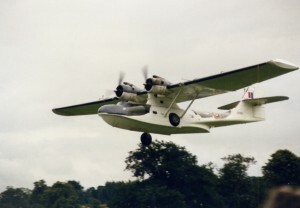 So we start off with an old photo of mine taken at the Weston Park Airshow, in the mid 1980′s. These were great shows that used to feature some rare aircraft, but some how they just stopped. It’s an American Catalina flying-boat or seaplane, flying very low indeed over the trees. 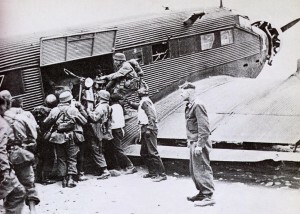 A lovely photo of a German Junkers JU52, with German parachute troops (Fallschirmjager) helping unload it’s motorcycle cargo. 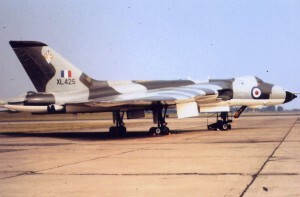 Now one of everyone’s favourite aircraft, one of the British RAF V-Bombers of the 1960′s. The Avro Vulcan with it’s magnificant delta wing and anyone lucky enough to have seen one at an airshow will know how those powerful engines make the earth move, when on full throttle as the aircraft goes into a steep climb . And finally to complete our week of aircraft, we have another British RAF plave of the 1950′/1960′s. If you like to get close and actually touch aircraft, then this one is for you. 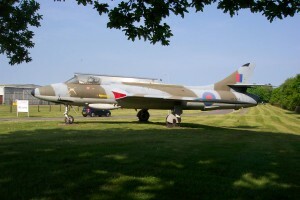 It stands at the entrance to the aircraft museum at RAF Cosford and you can just park next to it and walk all around. No barriers or ‘Do Not Touch’ signs. Surprisingly, to tap your fingers on it is like tapping the side of an empty tin can !!! So have a great week and we will see you soon. 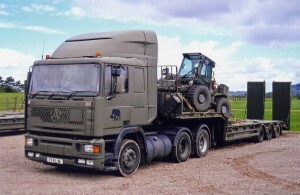 You are currently browsing the Military items | Military vehicles | Military trucks | Military Badge Collection weblog archives for the 'Weekly Posts' category.